Can you believe it? April is over! Another month gone...my, how fast time flies when there's so much knitting to be done! 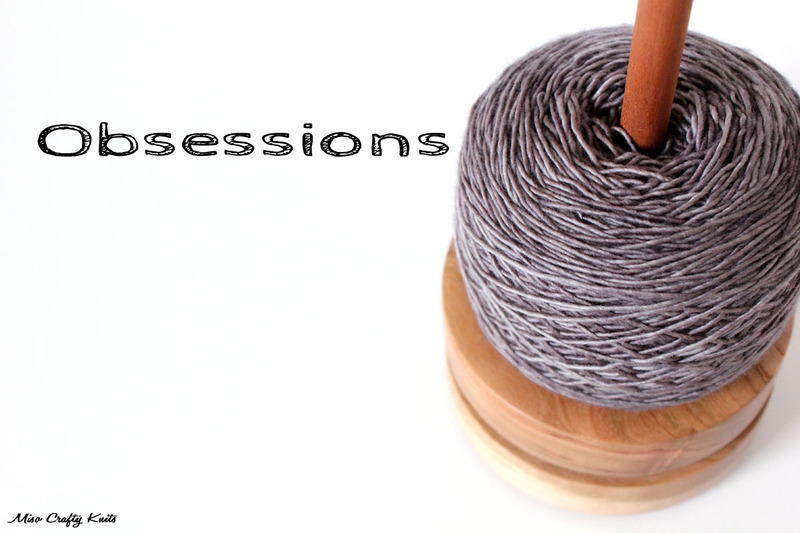 Even though I may not have blogged much about it this month, trust me when I say that a good amount of knitting has been going on around here. I just finished up the charity knitting that I had spent most of the month concentrating on, and I'm hoping that I'll remember to snap a few photos before I hand them over to my son's school. I wish I could say that I can now go back to the regularly scheduled programming of selfish knitting, but alas, I can't. I still have a few teacher gifts to knit up (and I really don't want to wait until the last few weeks to churn them out...who needs that kind of stress? ), and I don't know if it's just me or what, but it seems like everyone I know is either just announcing their pregnancy or they just gave birth. I have a feeling I'll be spending the rest of spring and a good chunk of summer with baby knits constantly on the needles. I honestly think all those years of selfish knitting is finally catching up to me and now I'm in never ending gift knitting mode! I absolutely love all the sock knitting that I've been doing for the Socks With Sarah KAL (I've knit 5 pairs this year so far! ), but I have to admit I really miss knitting cardigans and pullovers. I've always classified myself as a sweater knitter but since I've been using my time knitting up gifts and the not-so-secret secret projects, I just haven't had the time to indulge in my favourite kind of knitting. Well, no more!! All month long I've been dreaming, thinking, planning, and longing to cast on a sweater just for me. My Ravelry queue is pretty darn long but surprisingly I've quite easily managed to narrow down the choices to just 2 patterns without having to go through my usual hemming and hawing - one cardigan and one pullover tunic. Perfecto! And guess what? I've even picked out the yarn for both patterns - and they're all from stash!! Ok, that's kind of a lie. I had to buy a few skeins to contrast and supplement what I'm using from stash. But the majority of the project will be knit from stash. So really, those few newly purchased skeins don't even count. Hey! 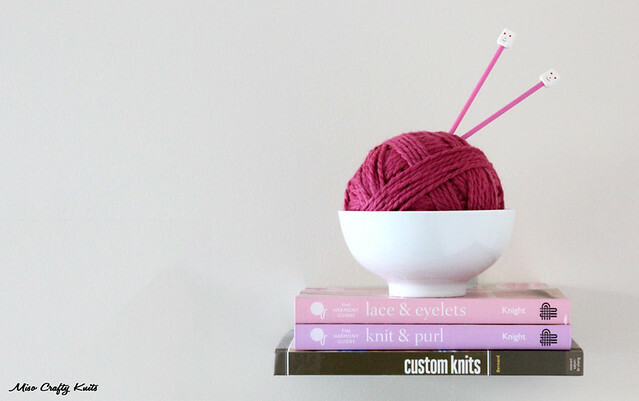 Look at the yummy yarn-y photo above! 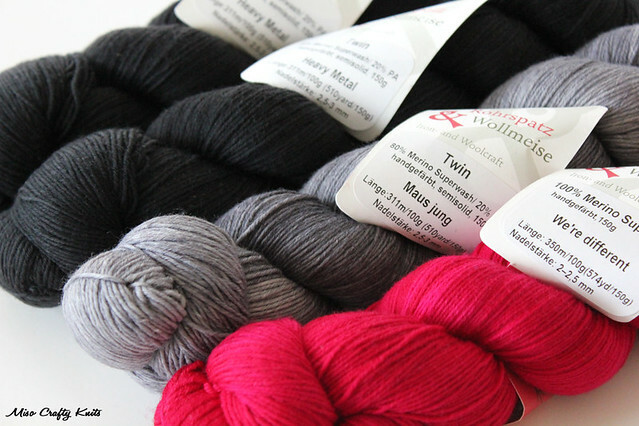 Now that I've successfully deviated your attention away from the topic of stash yarn, let's talk colour choices. Strangely enough I've picked out the same colour palette for both. Can you guess what it is? 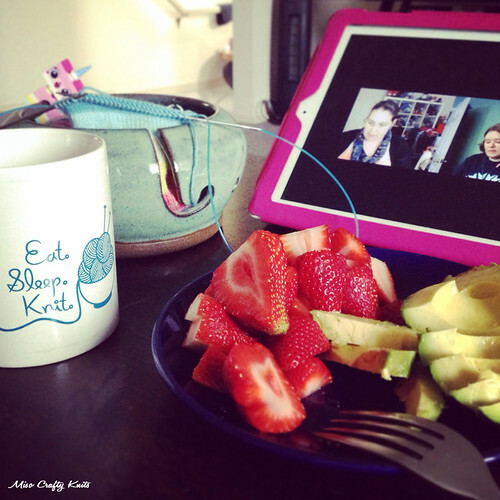 A while back a friend of mine had posted an Instagram photo of her knitting and her snack of sliced strawberries and avocados. Having never thought about pairing those two food items together and being mildly intrigued as to how that combo would taste, I promptly sliced up my own plate of fresh strawberries and avocado (I always have avocados in the house and luckily I just happened to have a carton of strawberries in the fridge), sprinkled a little Himalayan pink salt on the avocado, and had my first bite of heaven. It was that good. And it didn't even contain chocolate!! Now that's saying something! Since inhaling consuming that plate of deliciousness I've been devouring enjoying a plateful of this heavenly duo at least every 3-4 days. When I'm feeling a bit indulgent I'll whip up a balsamic reduction and drizzle it all over. Oh yes. That there is a good time. I'm already planning on spending the summer serving chopped strawberries in an avocado "bowl", drizzled with a balsamic glaze, and sprinkled with shredded mint...ooohh...it's going to be a yummy summer! 3. The Daily "5 Out"
As it goes with the spring season, I've embarked on the annual "spring clean". Just like in previous years, this year I've decided that we've got way too much junk and ultimately, clutter. This was exacerbated with the pending visit from the in-laws over the Easter weekend. As I've learned from the A&E TV show Hoarders, when an item has no home, it becomes clutter. And as I was trying to shove bags and armloads full of crap into every closet and hidden crevice so that it was out of sight, I realized that I needed to do a massive purge. More massive than the past few years. But who has the time to do such a purge when there's a ton of knitting to do?? So I've made the executive decision to carry out a daily "5 out" rule in which both the Mister and I must get rid of 5 items in the house every day. It could be something big, like a dust-collecting desk computer tower trolley (we haven't had a computer tower in almost 10 years! ), or it could be something small, like an expired bottle of medicine. Whatever it is, we must get rid of at least 5 useless items each day. It's amazing just how much we accumulate without even realizing it. So far I've gotten rid of a few bottles of really old and unused nail polish, recycled a whole whackload of magazines, donated all the unused kitchen items that have been collecting dust in a box in the pantry, thoroughly went through the medicine cabinet, and finally shredded the toppling pile of confidential papers that I've been meaning to shred and recycle for months now. It doesn't sound like much, but it's definitely a great feeling to rid the house of unwanted stuff and to re-gain precious space (especially when you live in a small dwelling!). Due to all the baby and gift knits, I find that I've been perusing all my stitch dictionaries a lot lately (and no, the above are not the only two that I own). Whether it's to make an effort to spice it up a simple knit, to mix it up a bit (when say, knitting the same baby pattern three times), or to get ideas for your contribution for a bigger project, stitch dictionaries have been a great resource and source of ideas and inspiration. My all-time favourite stitch dictionaries are the ones from the Barbara Walker Treasury set (you can view swatches knitted from the entire collection here). I'm always looking to expand my collection so if you have any favourites or know of any that are a must for a knitter's library, please let me know! Since I've been knitting a lot of swatches this month my "knitting ruler" (as well as copious amounts of measuring tapes!) is always within reach. And when I say "knitting ruler" I mean this ruler is not allowed to be used by anyone but me for any other purpose other than knitting. Both the Mister and the Munchkin know this. There's an unwritten rule in the house (no pun intended) that this ruler is not to be used like a regular straight edge. No. This ruler is special to me and I'd be mortified to find pen and felt marks, guck, food stuffs, and whatever else you can imagine that isn't fibre coating the edges or stuck on the ruler itself. Out of the plethora of rulers and needle gauges that I have amongst my knitting cases and basket, the Tricksy Knitter needle gauge and ruler is the one that I always use. Yes, I have the basic metal ruler/needle gauge that every knitter seems to have (you know which one I'm talking about), as well as a handful of regular plastic and wooden versions that I've acquired over the years or have bought as a souvenir. I even have a few cute needle gauges that never really see the outside of my knitting needle pouch. And you might as well count the regular old school-standard wooden ruler that's tucked away somewhere in my knitting corner. All of these rulers and gauges are great and work perfectly well, so why do I prefer the Tricksy Knitter knitting gauge? Well...where to begin?? First, I just love how clean the overall look of the gauge is. The red numbers and markings really stand out from the clear base, and I really appreciate that you can use the ruler from either side (see how the top part of the ruler is backwards?). But the absolute best thing about this ruler - since it's made out of clear acrylic you can SEE your knitting through the ruler. You can quickly count your gauge without having to double check to see how long 4 inches is because that clear window is exactly 4 inches wide. Using fuzzy yarn or knitting with a colour that doesn't show the individual stitches well? I love that you can just place the ruler over your knitting and count the stitches within the markings. All of these points really make the Tricksy knitting gauge stand out from all the others, since the majority of ruler/gauges are just simple rulers with a bunch of holes in them. Some may offer a small 2 inch slit to count your stitches, but really, wouldn't you want to pick for yourself just how many inches you want to see? Ok, that sounded dirty. Or maybe I'm just a pervert. Anyhoo, I bought my Tricksy knitting gauge years ago and I haven't bought a ruler/gauge since (most of mine were free from swag bags or came as part of a yarn club) and truthfully, I don't think I would ever use anything else. Well, maybe the Addi Stitching Counting Frame which looks pretty cool, but I could totally see myself snapping that in half in my knitting bag. So hands down, the Tricksy knitting gauge is it for me. 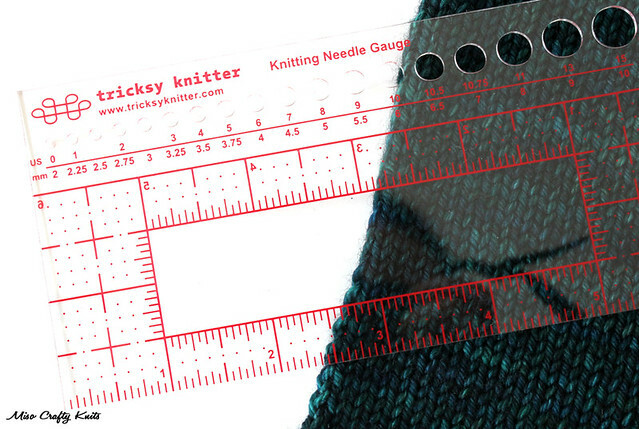 Would you like your own Tricksy Knitter Needle Gauge and Ruler? Well then, how about an impromptu giveaway? For reasons I can no longer remember, I decided to get an extra one when I bought mine. So why not share this awesome-sauce of a knitting gauge with you guys? The lucky winner will get a knitting gauge that is still in its original packaging and is all ready and roaring to go to its new home. All you have to do to enter is leave a comment telling me how many inches (or centimetres!) you like to count up to for your gauge. Make sure to include either your email or Ravelry ID WITH your comment, because how else can I get a hold of you if you are the lucky winner? This giveaway is open to everyone (yay!!) and is open until Friday May 2, 2014 at 11:00pm PST. The winner will be randomly selected and contacted within 48 hours after giveaway ends. YAY!! How fun is this! And hee, hee, hee...how sneaky of me to see if anyone actually reads this list! Ha! I was about to buy myself one of those with the link you posted, but then I saw "giveaway" and got majorly excited. Lol I've been having a crappy day and this is my ray of sunshine! As for gauge, I count up two inches in the little slit. My knitting gauge is attached to a book, so it's so awkward trying to measure anything I make! I usually aim for a gauge swatch that's approximately 4 inches x 4 inches. But I usually only count stitches in the middle two inches to get gauge. That way I'm not counting stitches that have been pulled wonky by the edges. I don't need to enter the giveaway, but I will say that when I measure gauge, I measure 4", 2", and 1" -- I'm always just curious how precisely my gauge translates over the different measurements. I'm super weird that way! I measure over 4", often using my son's art ruler, lol. I really should get a good gauge ruler. I usually measure over 2" and then multiply that by 2 to get the 4" x 4" gauge, since I always see pattern gauges are given in 4" x 4". It's partially due to my own laziness, but also my fear of running out of yarn (what if the gauge swatch is why I don't have enough yarn?). It's worked out well for me so far though! I do 2", If I'm lucky. I am very lazy when it comes to gauge. But that might change as I am about to start knitting my very first sweater (a Boxy!). I measure over 2" as well. Love that sweater colour combo-I always imagine it's trick to match WM colours when you're stuck doing it all online, but those look really great together. I'm a lazy traditionalist who measures over 4", and I'm not above using a sleeve as a gauge swatch. I am relatively new to gauge swatches- even though I've been knitting for a few years, I did my first swatch late last year! I usually do a 2"x2" (using one of those metal rulers mentioned above!). I am also genuinely intrigued about strawberries and avocado, and I love the 5 out idea (I'm a bit of a pack rat too!). I would like to lie and say that I make a minimum of a 4" square swatch every time but... alas. I will do one for at 4" wide but usually only for 2" long. I like that this one makes your swatch lie flat! I'm so bad at making swatches - frequently relying on the fact that kids grow and they'll eventually fit their knits. But, when I do it is 4x4 inches. thanks for including the Tricksy Knitter needle gauge! Awesome idea on the giveaway! 2 if it's a tricky stitch or i'm in a rush, 4 inches if it's really important! I like to use a 4" measurement - and take the measurement in several places and take an average. I've never done a gauge swatch *hangs head in shame* - that's why I need to win this ruler! I always measure up to 4 inches too. I enjoy reading all your blog posts! I measure about 4". What a great little tool! I usually measure 3-4 inches but it all depends on if the swatch is patterned or just plain stockinette. I love the 5 out a day rule although I can imagine it being tough. I've been doing a major unload in our house with still a pile in the basement to take to salvation army. Feels good to unload crap. I generally prefer to measure over 4 inches to get better accuracy, but that metal needle gauge/ruler we all have has those 2-inch windows that tend to tempt a knitter into measuring only 2 inches. This clear plastic one looks much better! I always measure over 4", but usually use a tape measure, and its bendy and annoying. That ruler is AMAZING!! Ok, I KNOW you're supposed to do 4" but sometimes, i cheat and count to 2" and double it! I typically like 4" for garments or lace accessories. Two inches (what my typical metal gauge window accommodates) is never enough, unless I'm measuring a sock-in-progress (which I rarely do). I like to measure the full four inches, but sometimes, if I'm feeling particularly daring, I go by the one inch.